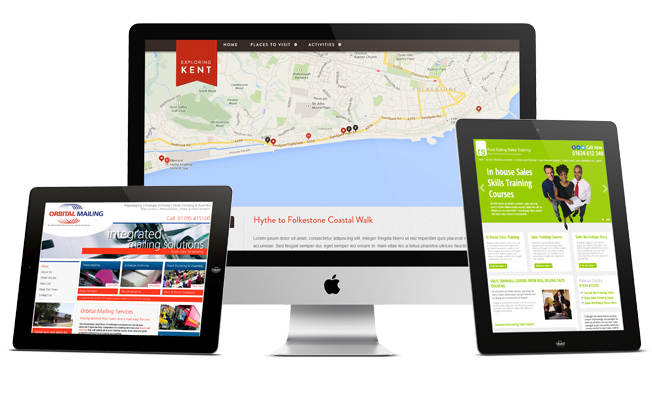 Require the services of an experience website design company in Kent? We are creative, experienced and expert at brining beautiful website projects to life. Having worked as a website design company in Kent for over a decade, delivering design and development projects on time and on budget to customers’ requirements, whether they be multinational listed companies or government departments, to SME’s and entrepreneurial start-ups. The approach we take to creating compelling websites is highly consultative in nature and we understand that your website should not only look great, but should also work effectively as a marketing tool helping to bring visitors, by being search engine friendly, and help to convert those visitors in to customers, sales or leads. As a website design company in Kent our portfolio is wide ranging with happy clients project in B2B, B2C, eCommerce, government and third sector. As a full service agency we have web designers, developers and marketers all in house working closely together and our approach is to cross pollenate this knowledge creating beautiful looking, functional websites that achieve the goals of the business or organisation. We are a truly multilingual website design company in Kent and can help you reach customers whether they are in Dover or Dubai, Maidstone or Moscow, Tonbridge or Tokyo. Our development work is carried out to the highest standards, meeting government requirements for disabled users, and our designs are fully responsive, working across mobiles, desktops and tablets. Our head office is in Canterbury the newly dubbed, “Tech City of Kent”! To find out more about how our web design services can help you achieve you goals give us a call on +44 (0) 1227 68 68 98, or drop us a line, to speak with one of our expert project managers or check out our client testimonials.